Leaving from Gran Canaria at 0659hrs GMT on 26 February 2012, this international crew left to row the Atlantic with the current record of 32 days to chase. Unfortunately, they had weather against them and counter-currents which hampered their progress. 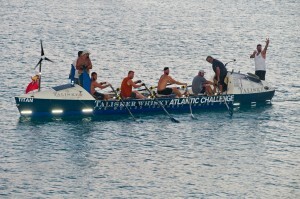 They arrived into Port St Charles in Barbados on 31 March 2012 at 1730hrs local time (2230hrs GMT) to celebrate their successful crossing with a very respectable time too. Click here to see the Crew Profiles, News Blog, Photos and Message Board. TIME TAKEN : 34 days, 15 hours & 31 minutes.